In 1903 Charles Lummis took his advocacy a step further, taking on an immense project. With his charter in hand for the Southwest Society, a chapter of the Archaeological Institute of America, he purchased an Edison wax cylinder recording machine and proceeded to “catch our archaeology alive” by recording the disappearing songs of the californios and Native Americans. Lummis recorded hundreds of songs from californio and indio descendants, as well as from descendants of Mexican immigration from the early American period. Those of the Edison wax cylinders still extant reside at the Southwest Museum’s Braun Research Library in Highland Park, now part of The Auutry Center. The link with historic californio families was still strong when Charles Lummis began recording songs in 1903. Doña Adalaida Kamp — an informant who recorded about 65 pieces for Lummis — was descended from the Higuera family that came to California in the 1780s. Adalaida’s mother was known for writing poetry and, like Adalaida, for improvising verses to songs — a valued skill not only in California, but also in Spain and many of the former Spanish colonies. Adalaida’s recordings represent some of the oldest extant songs from California. They are also the most difficult to transcribe. Adalaida was in her mid-sixties in 1904 when she made these recordings — not very old these days, but at that time she was well beyond her singing prime. Her singing is enthusiastic and sometimes even robust, her memory of the tunes phenomenal, but her pitch is not always true and her rhythm varies, so transcribing the pieces involves a fair degree of analysis. Luckily, the results are worth the trouble — these are also some of the prettiest and most unique of the pieces Lummis documented, with a strong portrayal of the californio sense of humor and independent spirit. Doña Adalaida grew up learning songs in the household where José de la Rosa, known affectionately as Don Pepe, resided. We see him here both as a young man and in his later years. Don Pepe, sometimes credited with being California’s first professional printer, came to California in 1833 with the Híjar-Padrés Party. Among his accomplishments he was alcalde at Sonoma for a time, and was involved in trying to obtain Mariano Vallejo’s release during the Bear Flag rebellion of 1846. He was also a popular musician, singer and composer who protected his material jealously so his competitors would not learn it. But he was impressed with the musical talent of the young Adalaida, and at his death he willed her his wordbook of songs carefully written out in his own hand. Adalaida recorded a great many songs from Don Pepe’s book for Lummis. Doña Adalaida in turn transcribed the words to her own songs, leaving both her typewritten wordbooks and Don Pepe’s word book in the archives of the Southwest Museum. The californio family of Rosa and Luisa Villa came to Alta California from Baja California in 1846. These informants also played dance tunes on the mandolin and guitar, and were influential in later romantic revivals of californio dances. Lummis recorded only about 20 pieces from this family, but a number of them include harmony arrangements with instrumental accompaniment, giving more clues about how to properly interpret the music. Lummis also recorded some charming pieces from their mother, Esequia Asevedo de Villa. Another of Lummis’ informants was Manuela García, born in Los Angeles in 1869, recording 107 pieces — the largest number from any informant. An accomplished singer with a tremendous repertoire, she grew up in a household that sometimes included the influential Mexican guitarist Miguel Arévalo. Most of the songs featured in the Lummis folio [see below] come from Manuela. Many of these pieces are probably more recent in California, coming with the Mexican immigration of the second half of the nineteenth century, but they have become so associated with californio heritage in the traditions of californio descendants that they have effectively merged into that heritage. Lummis recorded 23 pieces at Rancho Camulos, as well as learning dances from the del Valle familys traditions. For more information about Rancho Camulos and the del Valle family, please click here to read the notes from the CD. Despite Lummis’ familiarity with californio dance music and the fact that some of his informants also played dance tunes, Lummis recorded only pieces that included words. 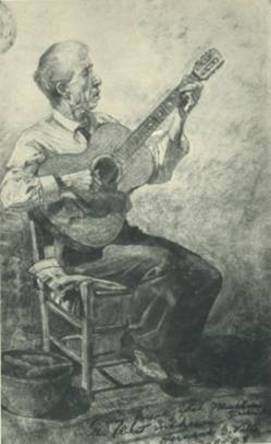 This drawing is by Hernando Villa, brother to Rosa and Luisa. Although Hernando was himself a musician and singer, there are no Lummis recordings of him. This music book of those songs, Songs from Francisco Amate, a Spanish vagamundo in California, is now available. Charles Lummis’ song folio was published in 1923. In 1923 Lummis was able to publish 14 pieces from these recordings in an influential folio, arranged by Arthur Farwell for ease of singing by amateurs and with singable translations. The majority of californio songs recorded by different groups in the 20th Century and remembered in descendent families come from that folio. Charles Lummis Letter promoting his book. Lummis had hoped to publish the entire body of pieces included in his recordings — on the cover of the early edition of his folio pictured above you will note that he thought this would be merely the first of a series of books. But that project was not completed in his lifetime — and there are several of us still at work completing it. Here pictured is a copy of a promotional letter from Charles Lummis announcing the publication of this folio, and asking for subscriptions. in it he refers to the plan to print further transcriptions. Arthur Farwell did, in fact, transcribe many more of the pieces in anticipation of further projects. For more complete biographical information about Lummis’ informants, consult the extensive research done by Dr. John Koegel, a recognized expert in the field of 19th-Century Mexican music in California. If you came to this page via a detour, return to where you left off at Spanish-Language Social Music of 19th-Century Southern California. Or take a further detour to explore the historic fiestas held at the Southwest museum’s Casa de Adobe. Los californios® is a registered trademark belonging to San Diego Friends of Old-Time Music, Inc., a California non-profit corporation.